Owens Corning (NYSE:OC), a leading provider of innovative building materials and glass-fiber technology, is delighted to have been named "Industry Partner of the Year" at the prestigious EnerQuality Awards of Excellence 2011, held last night in Collingwood, ON. These awards recognize leaders in construction who have demonstrated an exceptional commitment to building high-performance, energy-efficient, sustainable new housing. The Industry Partner of the Year Award is a prestigious title awarded to a company that has made a positive contribution to the building industry. "Owens Corning not only provides innovation solutions for the development of sustainable buildings, but it has made an effort to educate and advocate on behalf of the industry," said Corey McBurney, President, EnerQuality. "As the builders are responsible for nominating a partner, this award truly reflects the ideals of valued partners. We celebrate their achievements and consider them the gold standard." Owens Corning, with the support of Andy Goyda, Market development Manager, has developed a cost effective solution to meeting the Energy Star® for New Homes specification with its FOAMULAR® CodeBord™ Air Barrier System (CABS). This innovative system addresses the three principles of building science (heat flow, air flow and moisture flow) in an easy to install application. Because of the system's air tightness it will assist builders in meeting the next generation Energy Star® for New Homes standard. Energy Star® for New Homes call for 2.5 air changes per hour (ACH) at pre-delivery stage (just before keys turned over to homeowner) CABS comes in at 1.5 ACH at the framing stage. This has been verified by 3rd party independent blower door testing. Coming in at 1.5 ACH at the framing stage is a very cost effective system for builders. Additionally, Owens Corning has provided solutions throughout the entire value chain to help builders drive this product forward. It provides partners with installation training, sales pieces and advocacy tools, ensuring they themselves are experts on Foamular® CodeBord™ Air Barrier System. "We are proud of the work we have done to create sustainable building solutions," said Andy Goyda, Marketing Development Manager. "It means even more to us that our industry peers have recognized us as reliable advocates, who provide truly innovative solutions." 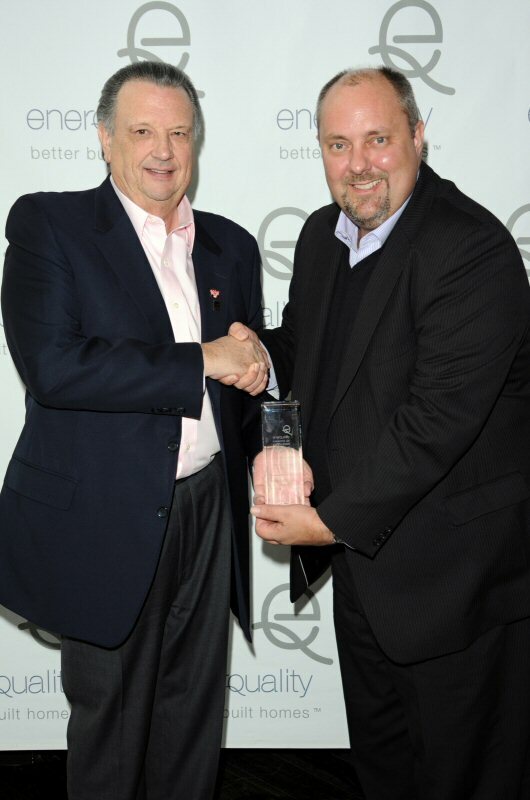 This is the second year in a row that Owens Corning has been recognized for its outstanding work. Last year it was awarded "Leader of the Year" for driving the growth of energy efficiency and green building in Ontario. Owens Corning (NYSE:OC) is a leading global producer of residential and commercial building materials, glass-fiber reinforcements and engineered materials for composite systems. A Fortune® 500 Company for 56 consecutive years, Owens Corning is committed to driving sustainability by delivering solutions, transforming markets and enhancing lives. Founded in 1938, Owens Corning is a market-leading innovator of glass-fiber technology with sales of $5.0 billion in 2010 and about 15,000 employees in 28 countries on five continents. Additional information is available at www.owenscorning.ca. About EnerQuality EnerQuality Corporation (www.enerquality.ca) is the market leader in green building programs. Founded in 1998 as a partnership between the Ontario Home Builders' Association and the Canadian Energy Efficiency Alliance, EnerQuality's mission is to transform Ontario's housing into the most energy efficient and sustainable in the world. To view the photo associated with this release, please visit the following link: http://www.marketwire.com/library/20120207-1-DSC_3712a.jpg.